was an American composer, conductor, author, music lecturer, and pianist. According to music critic Donal Henahan, he was "one of the most prodigiously talented and successful musicians in American history." This year, our Young Composer Concert is partnering with Bernstein 100 Austin; we're inviting participants to compose pieces inspired by his life and work. An exemplary array, Bernstein's works are significantly influenced by the historical context in which he was creating, his own religious questions and experiences, and the cultural variety of artistic influences to which he was exposed. The eclecticism of MASS's music reflects the multifaceted nature of Bernstein's career, with blues, rock, gospel, folk, Broadway, and jazz idioms appearing side by side with 12-tone serialism, symphonic marches, solemn hymns, Middle Eastern dances, orchestral meditations, and lush chorales, all united in a single dramatic event with recurring musical motifs. Listen here. Learn more here. With Jeremiah Symphony No. 1: II. Profanation, Bernstein not only established himself as a major American symphonist, he began a musical and dramatic exploration of a theme that would continue to inspire many of his major works throughout his career. "The work I have been writing all my life," he said in 1977, "is about the struggle that is born of the crisis of our century, a crisis of faith." Listen here. Learn more here. In his Kaddish Symphony, Leonard Bernstein exploits the dualistic overtones of the prayer: its popular connotation as a kind of requiem, and its celebration of life (i.e. creation). He does this both in his speaker's text and in his music. The Symphony No. 3 : I. Invocation is written "To the Beloved Memory of John F. Kennedy." Listen here. Learn more here. Overture with Leonard Bernstein to the operetta Candide, based on the 1758 novella by Voltaire by the same name. Listen here. Learn more here. The gem of Broadway musicals, West Side Story's commentary on love and prejudice is relevant to any time and place. Music by Leonard Bernstein. Listen to the playlist here. Learn more here. Leonard Bernstein's Symphonic Suite for the Academy Award-winning On The Waterfront debuted when the film opened in New York City on July 28, 1954. His score for the film received wide popular and critical acclaim, and the film won 8 Academy Awards, including Best Picture. Listen here. Learn more here. Scored for brass quintet and written in 1988, this piece exhibits some of Bernstein’s chamber music. Be sure to listen to the entirety of the work; the subsequent movements should play automatically on YouTube. Listen here. This is one of the earliest chamber works written by Bernstein. It is in some ways extremely removed from even the works he was writing ten years later. It is still a beautiful and fascinating work to study! Listen here. Bernstein believed, and expressed particularly through MASS, that there was a place for everyone in classical music. Bernstein was the first conductor to give a series of lectures regarding music on TV, and his emphasis on sharing his skills and passion with the public is encompassed in these three examples. Affectionately labeled as "The Greatest 5 Minutes in Music Education," in this clip Leonard Bernstein explains the evolution of the twelve chromatic tones of the western classical tradition via the circle of fifths, using the intervallic development of medieval monophony through tonal harmony of the 17th century and beyond. See the other Bernstein Lectures at Harvard here. In this clip, discussing Beethoven's 6th & 7th Symphonies, Bernstein describes in detail the humanity of Beethoven. Here we get a glimpse into not only Beethoven “the man,” but we get to peer into Bernstein’s humanity as well. He enumerates Beethoven’s faults as a composer, but he credits his true genius as well. An interview with Bernstein regarding his important teachers and his thoughts on teaching. It’s a compelling look at the colleagues who inspired him most as a composer and conductor: Copland, Koussevitzky, Reiner, etc. 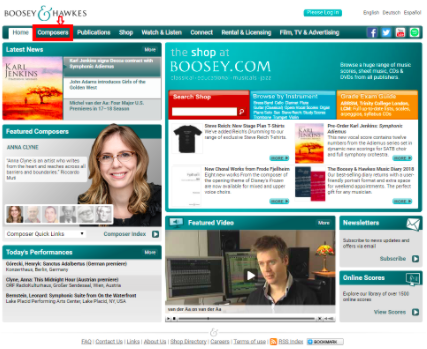 1) Go to Boosey & Hawkes' website. 3) Once there, click "Online Scores"
6) Once you have an account, you can peruse all of Leonard Bernstein’s online scores at this link. Step 2: "Composers" Tab highlighted in red. Step 4: "Register" Area highlighted. Step 3: "Online Scores" highlighted.